On Sunday, we woke up to the sun streaming through the blinds. Just like the Sunday before, it was a beautifully bright Autumnal morning. I pulled up the blinds and saw the brightest blue sky, Autumn coloured leaves and the mountains were on full show, just look at them. I lingered a little longer in the world’s most comfortable rocking chair with the doors wide open and felt the sun on my back, I basked in it like a tired cat. 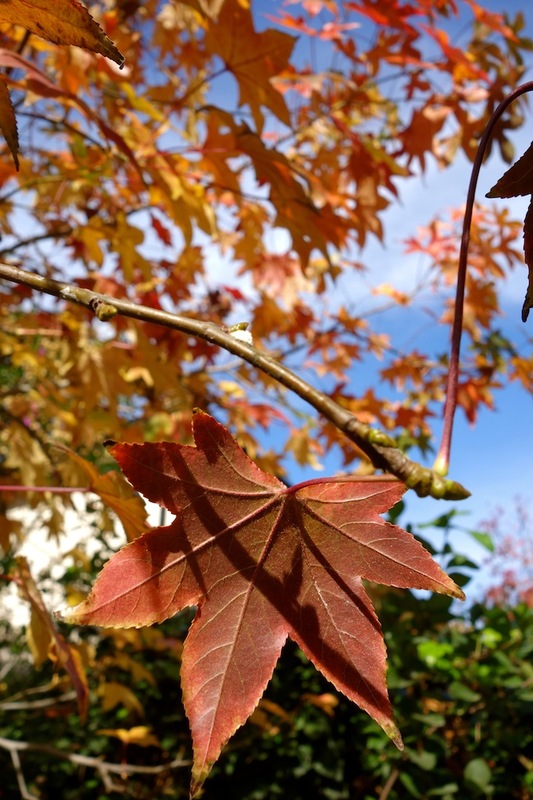 Just six months ago I wrote about Autumn in London, and now six months later, I’m here to share tales of Autumn in Santiago. I left England at the end of Autumn, meaning I skipped to Spring in Chile then got to have a reaaaaally long Chilean Summer… Now, back to Autumn again and a big cheer for having missed winter for a year and a half! Anyway, Autumn in Santiago has brought with it a fair amount of rain and of course Those Floods. Which means, on a sunny Autumn day, you have to make the most of being outdoors. 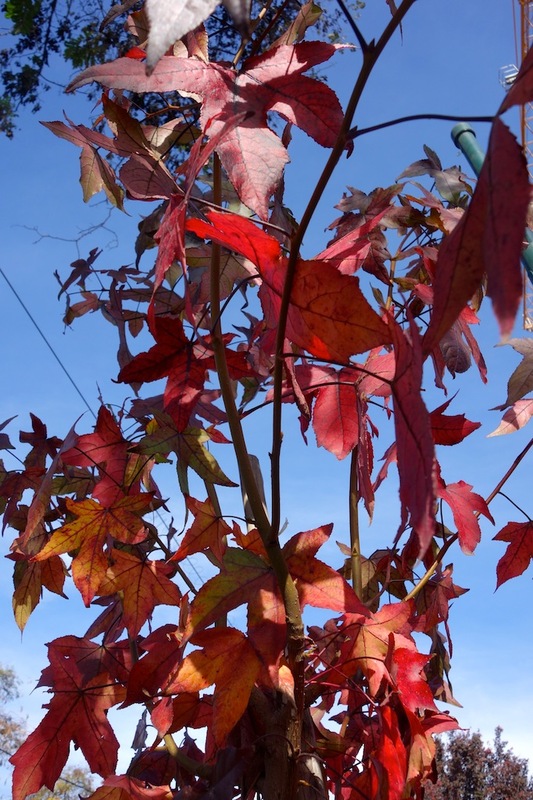 I walked around my local area finding every colour of Autumn against the bright blue backdrop. It was definitely too warm for a coat, and it felt like I had the streets to myself as Sundays are always peaceful. 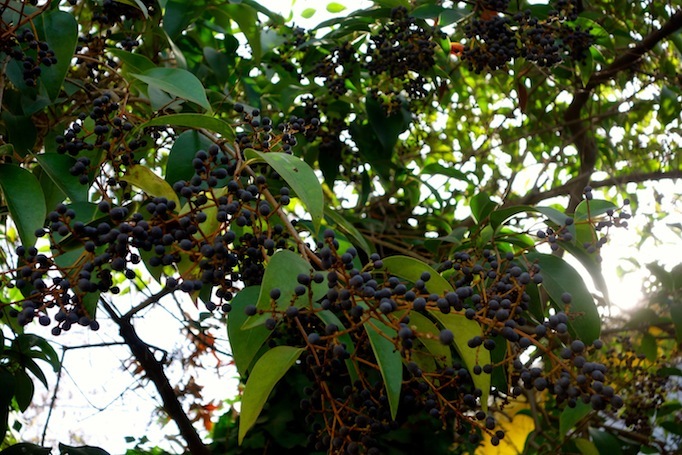 As I wandered, I still felt confused by the fact that it’s Autumn in May and that Christmas is very far away despite the fact that it feels like it’s just around the corner as the weather cools down and winter fruits appear in the markets. 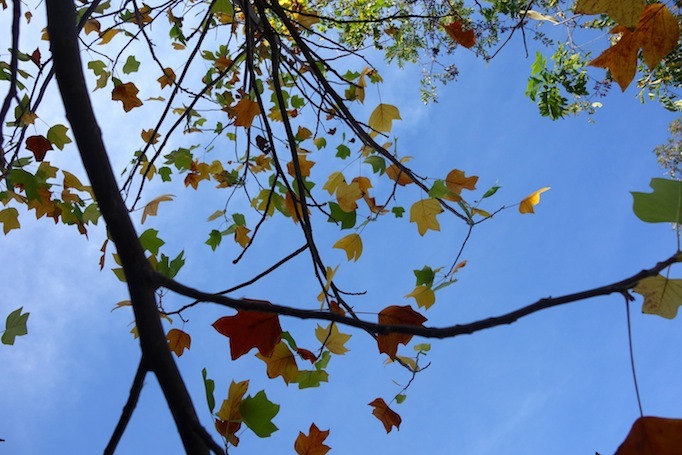 But, rather than worry about which month it was and why I was still thinking I was in the Northern Hemisphere timings, I took in all of the colours around me and snapped away, looking up at every tree and admiring how many colours surrounded me. 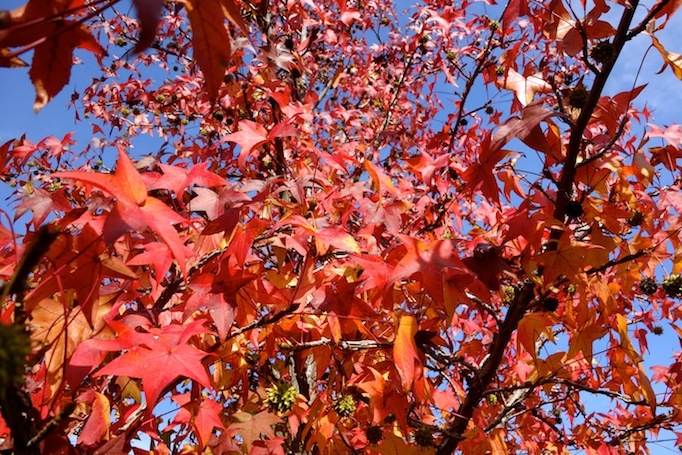 Is Autumn not just the most colouring bursting season? Or maybe, you could say the same about every season. Which season are you basking in? So, are you ready for week two? Now, it’s time to link up 🙂 >> Click here to enter your link! I feel like it would take me a while to get used to the different seasons in a different hemisphere. Beautiful photos as always! Thanks Mani, the colours were just jumping out from everywhere 🙂 I think it’ll take me a good while to get used to it but I’m definitely not complaining about the very long summer here, it really was amazing!! Marcella, very nice information. I just Googled it and have found that Chili enjoys some seven climatic types and Santiago enjoys Mediterranean climatic type. Wow, it seems amazing that when its summer here you’re going to embrace winter. What’s the minimum temperature in winter and how hot in summer? Thanks, so glad you enjoyed the post! Due to Chile being crazily long, it really does have so many climates, it’s insane. Here in Santiago, the maximum temperature is around 36 in the summer, but I’d say an average day is between 30-32 and during the winter the coldest is probably 0, but it warms up a lot more in the summer to probably around 10 but usually more 🙂 I like the weather here! It’s supposed to be Autumn here but most days it feels like summer still. I’m so ready for some colder weather, although it always tricks me into thinking Christmas is around the corner. Nice!! We have definitely had some ‘summer’ type days here too. All my colleagues were complaining about the cold but for me it’s still warm, haha. The Christmas in the heat thing is still really weird for me too! I am from the U.S. but have lived in Australia since late 2008. The “opposite” seasons still confuse me a little. 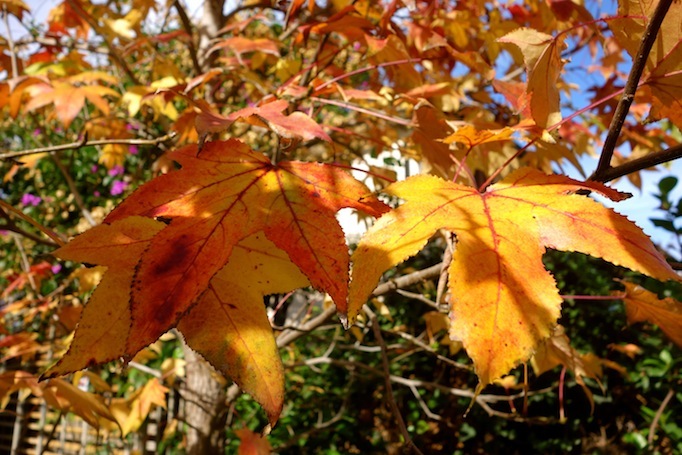 It is autumn here too and cooler temps have arrived. 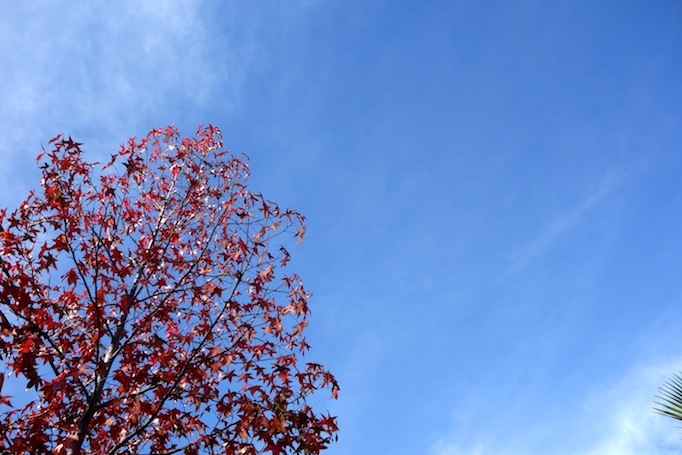 Like many of these pictures, we have gorgeous blue skies that serve as magnificent backdrops for the Autumn leaves. Enjoy your Autumn in May as I will mine! What stunning colours! I love Autumn in the UK but it looks even more spectacular in Chile. 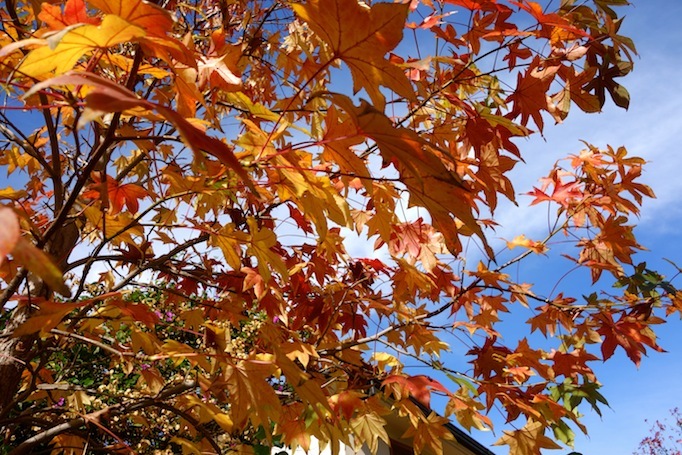 It’s so wonderful to see such beautiful Autumnal colours from the other side of the world. I’m so enjoying reading all the blog posts on #WanderfulWednesdays. Thank you SO very much for making my post about Sintra one of your favourites. Aren’t the colours the best! It’s been really fun to experience a London and a Santiago Autumn just months apart 🙂 Thanks so much, I’m so glad that you are enjoying the posts, I loved yours from last week!! 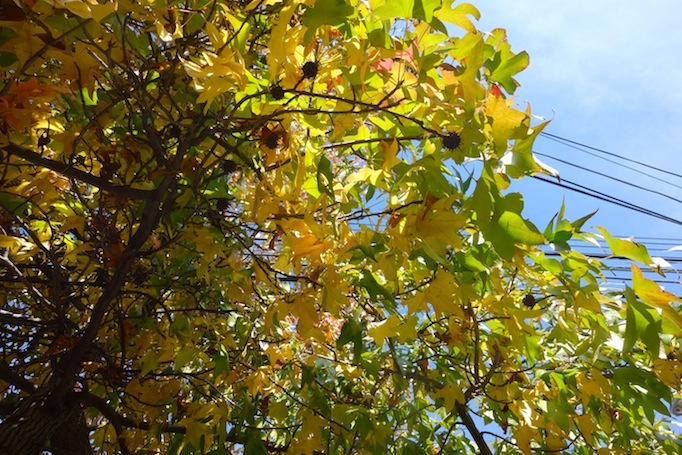 All of the colors of Autumn are so pretty in Santiago! That’s too funny that you’re already having another fall so close after the last one, but it definitely seems like it’s a lot warmer than an English fall considering your don’t need a jacket! Aren’t they just? I love my walk to and from school as I get to see them everyday 🙂 Definitely! Chile is so much warmer than at home in London, and I’m so not complaining! Autumn colours are AMAZING! It’s so strange to think that our summer is just starting in Canada but that summer has already finished in the Southern Hemisphere! They are so so pretty, aren’t they? I know, I can’t really get my head around it, but I need to adjust sooner rather than later, hehe. And here I was thinking you were sharing a post from way back last year 😀 Still seems so strange, yet fascinating to me that there’s autumn in the southern hemisphere now! I absolutely can’t wait for summer to arrive in the Arctic 😀 Beautiful pictures! I bet!! I always, always look forward to summer though I have to admit that summer here in Santiago is verrrry hot, so I think I actually prefer Spring and Autumn here to Summer, which is something I didn’t think I’d ever say! Lucky you for skipping winter for a year an a half!!! haha. And I bet it must be super confusing for it to be cold during our “summer”. Makes it for the perfect excuse to have Christmas in July! 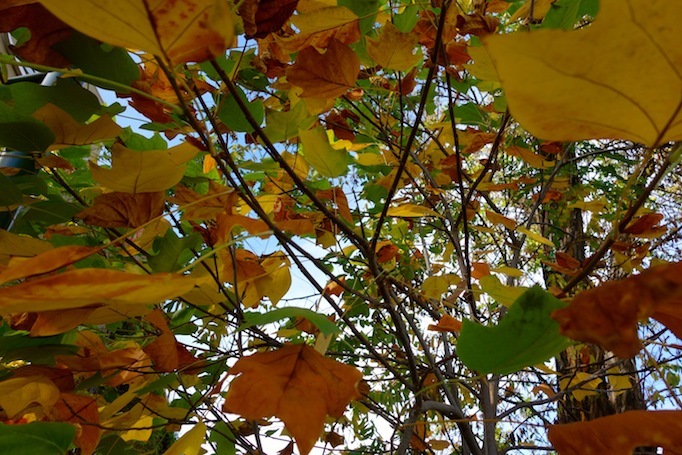 Gosh – with the mountains in the background as well and the beautiful blue sky of south america, this is the loveliest way to view autumn (Even though I’m in the UK still waiting for summer!) 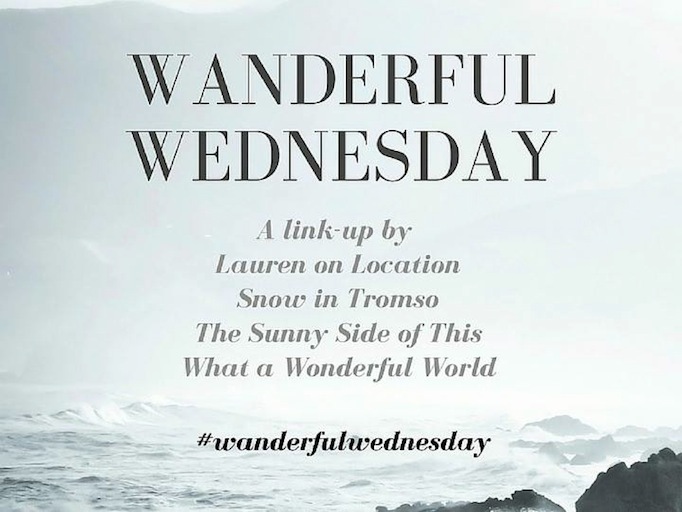 Oh and you are right… I’m loving this link up – my Wednesday are filled with so much inspiration and wanderlust now!! Hoping to add to it soon too. It really is the most amazing view, it makes me so happy each and everyday 🙂 Thanks so much, I’m so glad that you are enjoying the link up, excited for you to join in soon!! I could do with skipping a winter! It feels like it still hasn’t ended here in the UK…! Those colours are absolutely beautiful, and I love the look of those quiet and peaceful streets. What a lovely place you live in! a friend of mine is nannying in Australia and she was just telling me yesterday how chilly it’s starting to get down there! I’m eager for summer to start here in the states, but I think autumn is by far the prettiest season! My favourite season has been autumn since I first experienced it over a decade ago in Stockholm. Beautiful photos. It’s the tropical monsoon season here now and this year, it has been quite nasty with flooding and landslides. Ohh nice, I’d take the beach any day! How lovely! I haven’t seen beautiful autumn colors like that for yeeeears. I wish I could just have autumn and spring year round, but unfortunately, the places I choose to live in means summer year round, haha! But how nice that the weather is cooling down! Beautiful colors – but I still prefer that it’s only spring now, so I can look forward to wearing my flipflops!